Compressors and expanders are everywhere. Modern economies convert massive amounts of energy between heat, pressure, shaft power, and electricity. The machines that make those conversions possible are compressors and expanders…they compress, heat, cool, transport, separate, and turn generators. 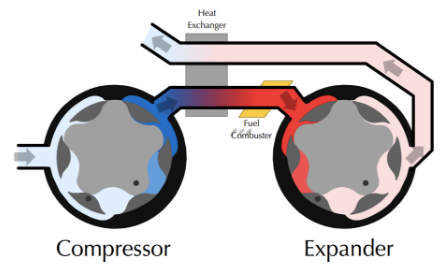 Engines perform both compression and expansion…engine efficiency depends heavily on how well they do both. Our technology development efforts aim to impact the entire world by making fundamental energy transformation processes more efficient. Compressors and expanders are usually classified either as positive-displacement or as dynamic machines. Positive-displacement (e.g., reciprocating or screw) machines confine and squeeze (or expand) a fixed quantity of gas. Dynamic machines (e.g., turbomachines) use momentum to continuously push gas molecules into an open volume. Conventional reciprocating machines can achieve high compression ratios, and can accommodate some flow variation by speeding up and slowing down. Decades of mass production have brought down costs. However, pistons, valves, and cams make these machines bulky, heavy, complex, and inefficient. Dynamic machines can achieve high throughput and high efficiency at large scale and high speed. But they are typically large and inflexible. Dynamic machines adapt poorly to changing flow rates and conditions. They do not scale down efficiently or affordably because of complex surface and volume interactions. Large pressure ratios require many expensive, high-speed stages. 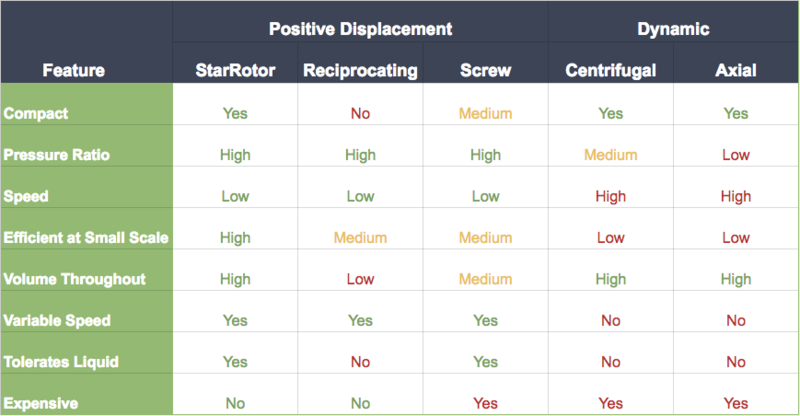 StarRotor compressors and expanders are unique because they capture the best attributes of both positive-displacement and dynamic machines. The underlying gerotor concept has been used for a century to pump lubricating liquids, and is known for its efficiency, reliability, and ease of manufacturing. StarRotor has adapted gerotors for applications with gases, effectively creating a positive-displacement turbo machine with smooth, purely rotational motion. Oscillating masses are eliminated together with the mechanical and geometric complexities of competing technologies. A gerotor has inner and outer rotors. N inner rotor lobes fit N + 1 matching cavities in the outer rotor. Each rotor spins smoothly on its own axis of symmetry, but the two axes are slightly offset. The speeds differ by a fixed ratio corresponding to the different number of lobes and cavities, so that the volume within each cavity expands and contracts cyclically as the assembly rotates. All chambers operate simultaneously, processing a large volume with every rotation. When spinning in one direction, the gerotor functions as a compressor. When spinning in the opposite direction, the gerotor functions as an expander. To adapt gerotors for gas compression and expansion, StarRotor has pioneered innovations in several areas. The rotors are synchronized to prevent contact between lobes and cavities, and to eliminate the need for flood lubrication in the working space. Abradable coatings create a custom fit between inner and outer rotors to minimize internal bypass leakage. Advanced seal designs minimize leakage. Sophisticated porting ensures smooth gas flows with minimal internal pressure losses. These inventions are made practical by the relatively simple “two-dimensional” geometry of StarRotor components, and by modern manufacturing technology that makes it affordable to maintain the required tolerances. Our long-term objective is to exploit the virtues of StarRotor compressors and expanders to develop super-efficient engines. Brayton cycle engines, especially in their recuperated form, can achieve efficiencies 2 to 3 times better than the best technologies currently available at similar scales, and can additionally benefit from fuel flexibility, smooth operation, and robust simple manufacturability.